I have been making these potato packets for so long I don't even know where the concept originated. Although the recipe indicates amounts for ingredients this is certainly a recipe you can just throw together without measuring. This is also a great recipe for camping or to serve at a picnic. Lay out all the pieces of aluminum foil that you will need. Place butter in the center of each piece of foil. Place the onions on top of the butter. Starting at the narrow end, cut each potato into 1/4" slices. Place slices on top of onions. Add salt and pepper as desired. 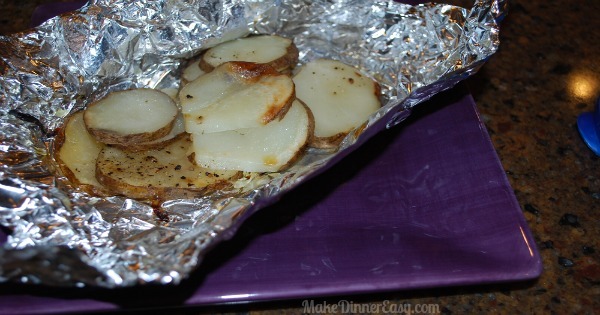 Bring ends of the foil together and fold down to seal the foil tightly around the potato and onions , keeping the packets as flat as possible. Place packets on a grill on medium-low heat. Cook on each side for 20 minutes or a total of 40 minutes. 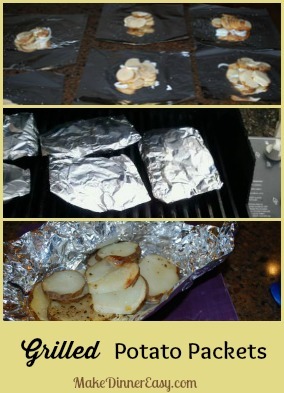 We usually grill the potato packets first, then keep them warm on a rack inside the grill while grilling the main course. Foil packets can be placed in a basket and your family or guests can serve themselves. Want to make these on another day, Pin it for later!